Twice the overall power and three times the life of conventional batteries. Up to 400 cycles at 80% depth of discharge. The ODYSSEY battery delivers massive starting power, rapid recovery, and extreme durability that heavy duty and commercial vehicles demand. 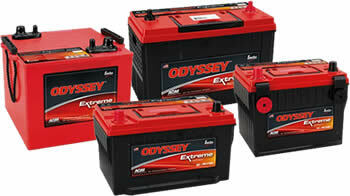 Superior cranking power and deep cycle ability mean ODYSSEY Extreme Series batteries get the job done. With today's no-idling laws, big rigs need a battery that can keep everything in the cab running when the engine isn't. The ODYSSEY battery can power a range of on-board accessories and still deliver reliable starts. Along with dusty, dirty job sites, building equipment has to endure repeated shock and vibration. With its rugged, sealed construction, ODYSSEY batteries are built to take a pounding and perform in the toughest conditions. Farm vehicles have to perform in harsh environments, often after sitting idle for months. With the ODYSSEY battery they'll start reliably for up to two years (when stored at 77° from a fully charged state. The electronics in today's RV's and charter buses require deep cycle reserve power. The ODYSSEY battery delivers it while providing massive starting and up to 3X the service life of conventional commercial batteries. With its maintenance-free starting power and massive deep cycle reserve power for on-board accessories, the ODYSSEY battery protects and serves when it matters most. Heavy duty 1200 cranking amp battery available with metal jacket and SAE automotive terminals. 78 minute reserve on a 25 amp draw. Also available in a left post positive format. 1500 cranking amps and 135 minutes reserve on a 25amp load. 1750 amps of cranking power. 135 minutes reserve capacity. 2150 amps of cranking power and 205 minutes reserve on a 25amp load. Group size 31 replacement. Available with SAE or 3/8" stud posts.